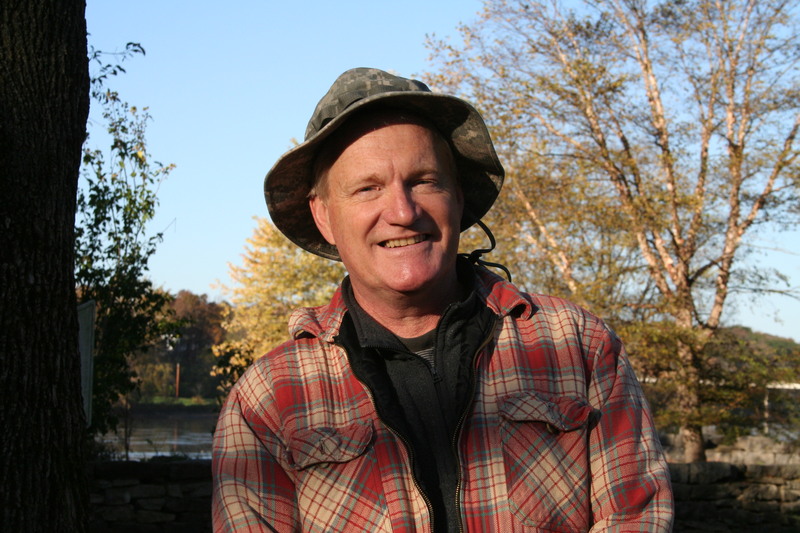 John Preston is a full-time painter and wonderful teacher. Phil Roberts photo. Villages Folk School manager Ken Burns drops in on each class. Phil Roberts photo. John thoroughly explained everything he did. Phil Roberts photo. John demonstrates a technique to Sue Burns. 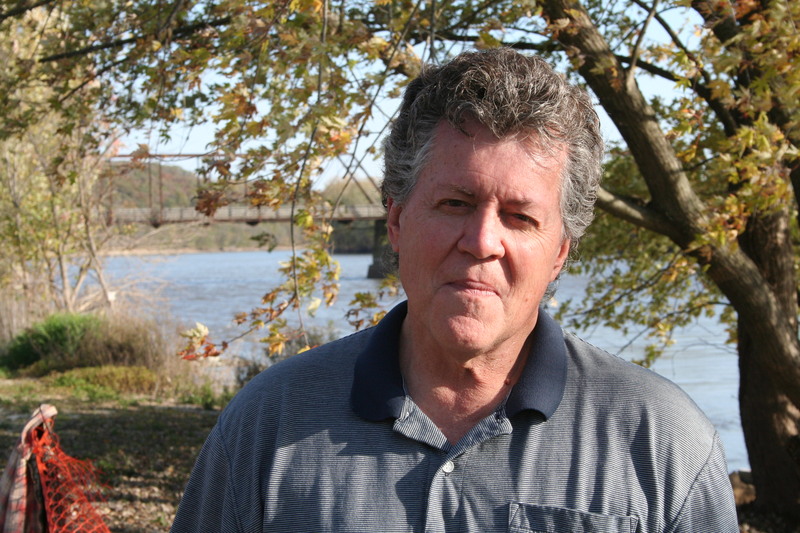 Phil Roberts photo. John works with Jeanette Corley as I try to look like I know what I'm doing. Ken Burns photo. Jeanette Corley is obviously not a novice. Phil Roberts photo. 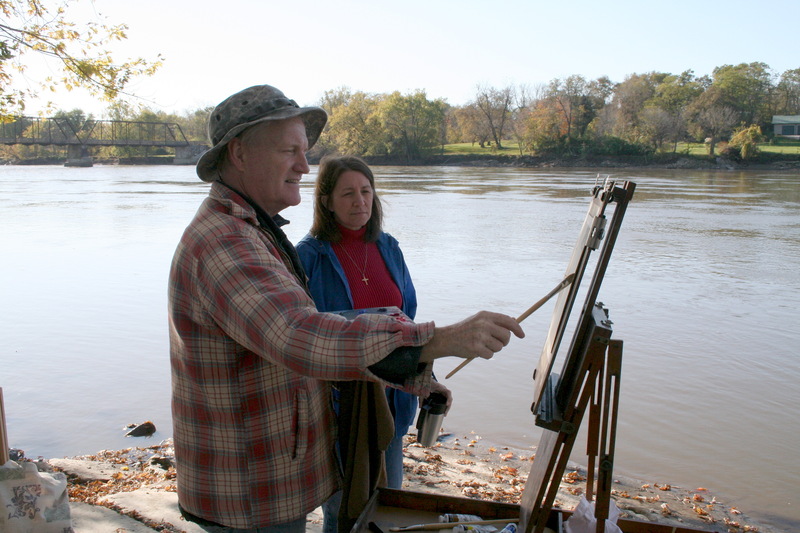 Carroll Michalek is an experienced painter, too. Phil Roberts photo. 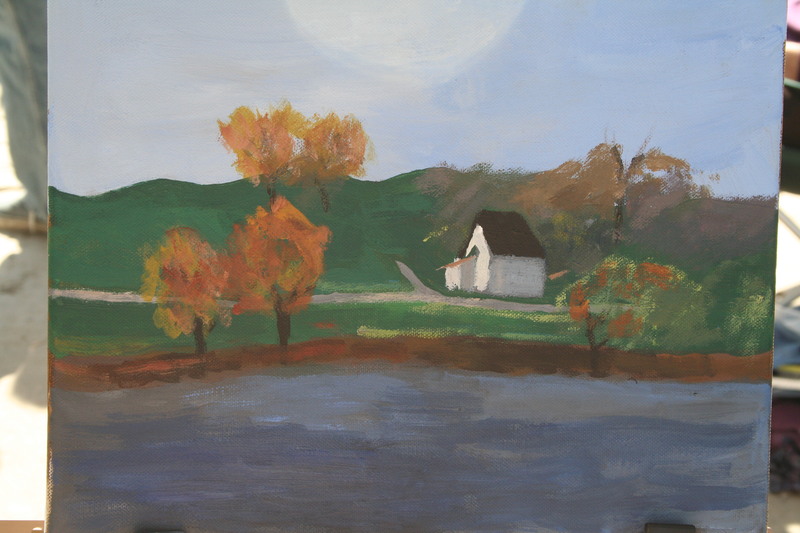 If painting is like riding a bike, here I am without training wheels. Ken Burns photo. My first effort. Thanks, John, for your help with the trees or I'd still be there doing leaves one by one. Phil Roberts photo. My various jobs over the years — particularly in public relations and news reporting and as a freelance writer — have allowed me to meet some interesting people and do some interesting things. I’ve been a modern day Walter Mitty at times. Mitty, should you have forgotten your school literature class, is a dreamer who imagines himself working in a number of occupations. He was a character in a short story, “The Secret Life of Walter Mitty,” by James Thurber, first published by The New Yorker in 1939. I’ll admit it: There’s some Walter Mitty in me. And I suspect there’s some in lots of reporters and writers. Maybe in you, too. Take last weekend, for example. Mrs. Mitty….er, I mean my best friend and my wife, Sherry….and I signed up for classes in the Villages Folk School (villagesfolkschool.com) of Van Buren County, in southeast Iowa. Classes there run from January through November in everything from candle making and beginning knitting to blacksmithing, poetry and basket weaving. They are taught by local artisans. More than 100 students from five states have taken classes this year from 27 instructors. Burns hopes to double that number and offer continuing education credits in 2011. 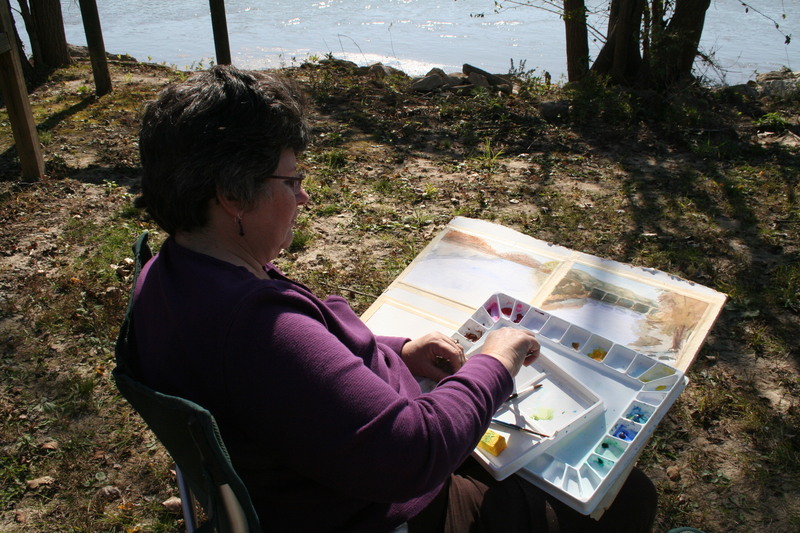 On Saturday (Oct. 16), Sherry took an all-day fall bird-watching course ($69 fee, lunch and transportation included) taught by Raymond and Connie Morris. 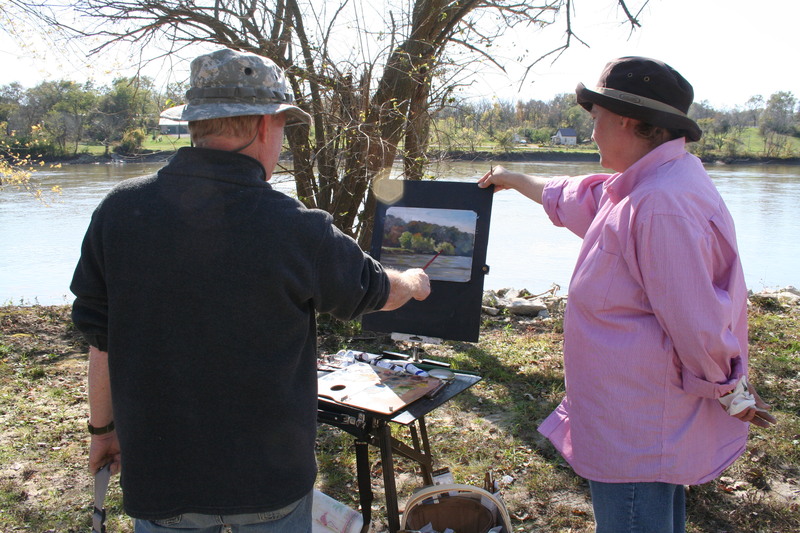 I took an all-day painting-the-landscape course ($55) taught by John Preston. I intend to write a freelance story about the experience and sell it for publication. Sherry’s only need for her class was binoculars, which she already owned. My materials list, on the other hand, was longer. Little by little beginning in July, I gathered an easel, palette, brushes, canvas panels and paints from eBay, Amazon and other sources. We stayed last Friday night (Oct. 15) at our favorite B&B, Chuck and Joy Hanson’s Mason House Inn in Bentonsport. After one of Joy’s delicious breakfasts on the next morning, it was off to class. 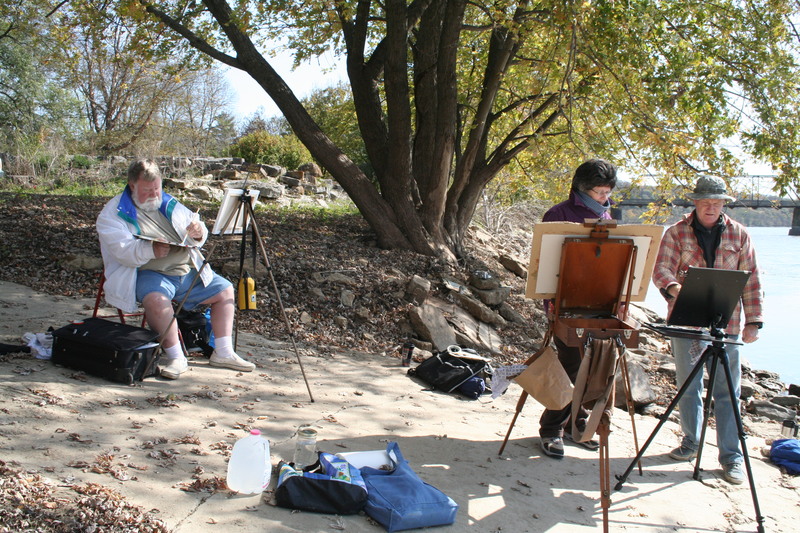 Sherry dropped me at the site of an old mill on the riverfront in Bentonsport for my painting class. Then she headed to Mt. Sterling, a wetlands area and the starting point for her bird-watching adventure. At the end of the day, Sherry raved about her class and all she’d learned. My class was worthwhile, too — although I decided not to quit any of my day jobs. 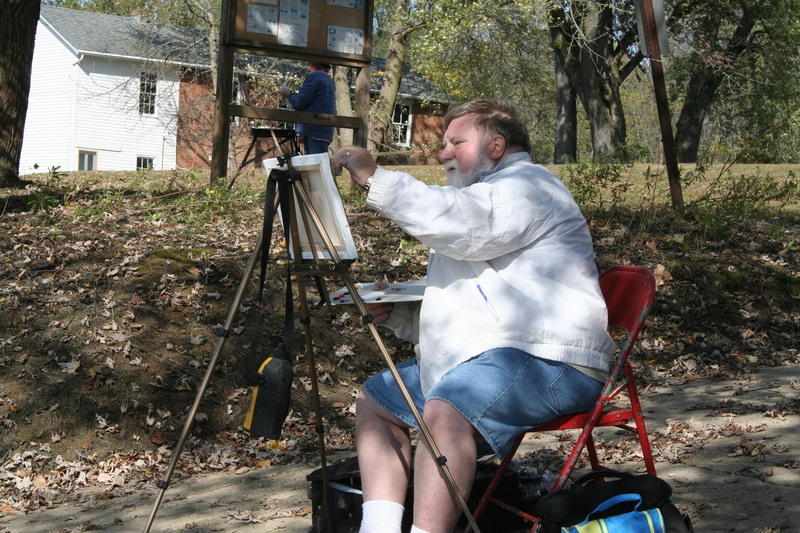 John, a talented, full-time landscape painter, was an easy-going, patient teacher who dealt professionally with my obvious lack of experience and, perhaps, talent. The class had four students — three women and myself. I wasn’t in class long before it became obvious to me the women had painted before. But, like John, they were kind to this rookie. Translation: They didn’t laugh at the colored splotches I dabbed on my canvas. John and I had exchanged some e-mails in the weeks before the class, and I had expressed some concern as to what I had gotten myself into. He was right about that. At least the messier part. When it was over, I had many colors of paint on my hands, jacket, T-shirt and shorts. There was some on the canvas, too. What ended up on my clothes may actually have been my best work. There I am by our van at Superior 71, with the big screen in the background, as dusk approaches. Sherry Roberts photo. The combination snack bar/projection area at Superior 71. Phil Roberts photo. 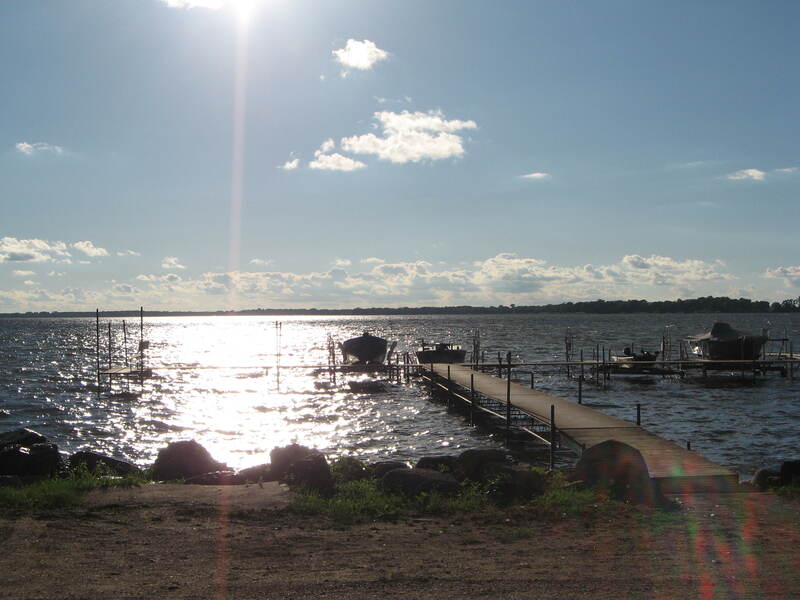 We stayed in a pleasant cabin this summer at Sandbar Beach Resort on the east side of Spirit Lake. Phil Roberts photo. 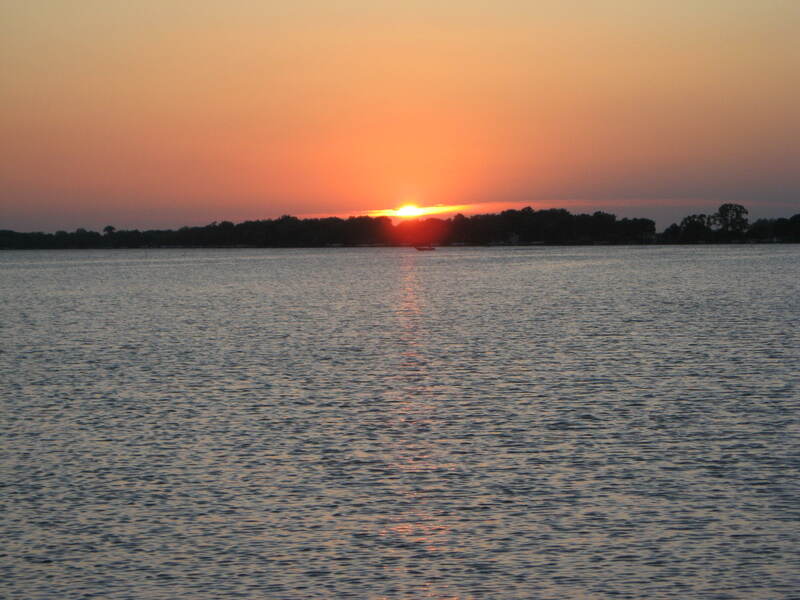 This is an Iowa Great Lakes sunset. Phil Roberts photo. The view from our cabin. Phil Roberts photo. Last June, for the first time in years, my wife Sherry and I went to a drive-in movie. It was while we were on vacation at Iowa’s Great Lakes region. We had honeymooned in that area in 1969 and hadn’t been back since about 1978, when the third of our four children was a baby. 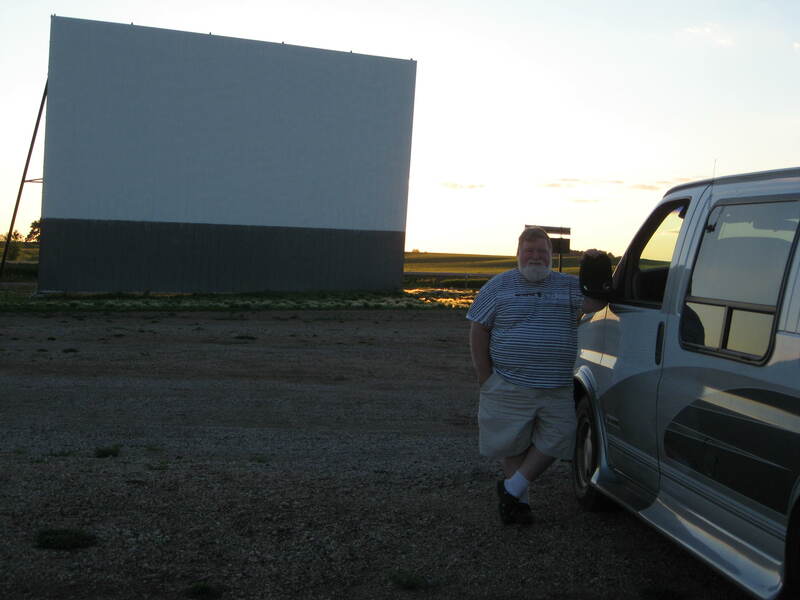 It was while we were exploring our surroundings on the east side of Spirit Lake on this trip that we happened upon Superior 71 Drive-in Theater at the junction of Highways 9 and 71. We immediately put it on our list of things to do. My interest in drive-in theaters goes back to my childhood. From my third through 10th years, 1952-1959, my family lived on Dugan Court, off North Lincoln in Davenport. The Bel-Air Drive-In (1948-1986) sat to the west, with only a small, wooded ravine separating it from our small subdivision. Although I didn’t appreciate it at the time, I could watch the Bel-Air’s movies — albeit without sound — from my bedroom window at night. During the day, when no one was around, my friends and I would sneak through the ravine onto the Bel-Air property, where we played in the cab of an old junk truck in the weeds at the back of the lot. I also remember going to the Bel-Air with my parents and brother to see movies now and then in the early ’60s. The only flick I can remember, though, is “Hatari!,” a 1962 adventure starring John Wayne, Red Buttons and Elsa Martinelli. Fast forward to rural Spirit Lake, Iowa, and Superior 71. 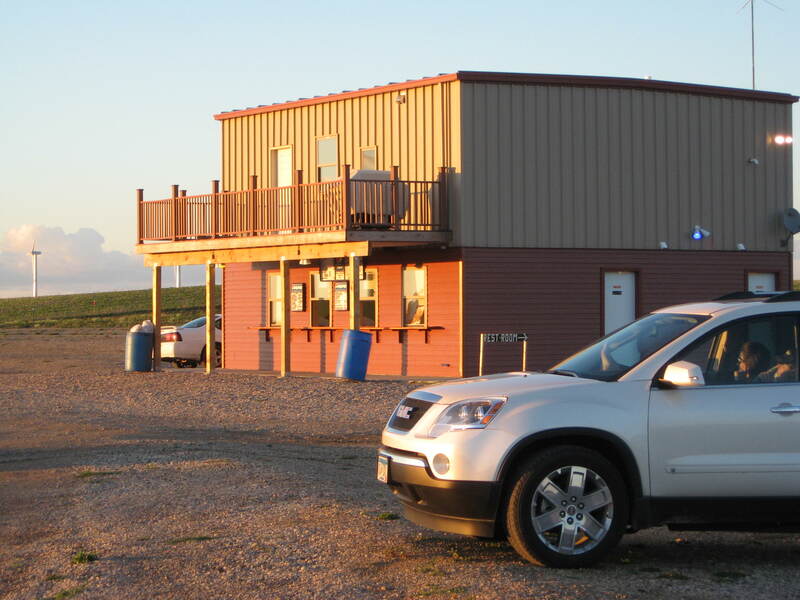 According to an Estherville Daily News story I found online, Gaylord Kemp of Alpha, Minn., opened the theater in the summer of 2008, using a 90-foot-wide screen that he took apart and moved from the site of the former Chief Drive-in Theater near Estherville, Iowa. Kemp’s theater, which shows double features – we saw “Date Night” with Steve Carell and Tina Fey and “Robin Hood” with Russell Crowe and Cate Blanchett –accommodates several hundred cars. But we were there on a Tuesday, not a prime movie-going night, and there were less than a dozen vehicles in the place. We chatted a bit with Kemp, the lone ticket seller. We later watched as he shut down the box office at dusk and headed to the combination snack bar/projection house in the middle of the lot, where I suspect he then became the projectionist. Kemp’s is one of only a handful of drive-in theaters in Iowa. But drive-ins are making a minor comeback from their heyday in the late 1950s and early 1960s, when there were 4,000 of them across the United States. One reason for the resurgence is empty nesters, who have more expendable income than they used to and long for nostalgic entertainment. If you have a yearning to step back in time and see a movie under the stars, eastern Iowa is home to two drive-ins with a third proposed for west of Davenport in Scott County. 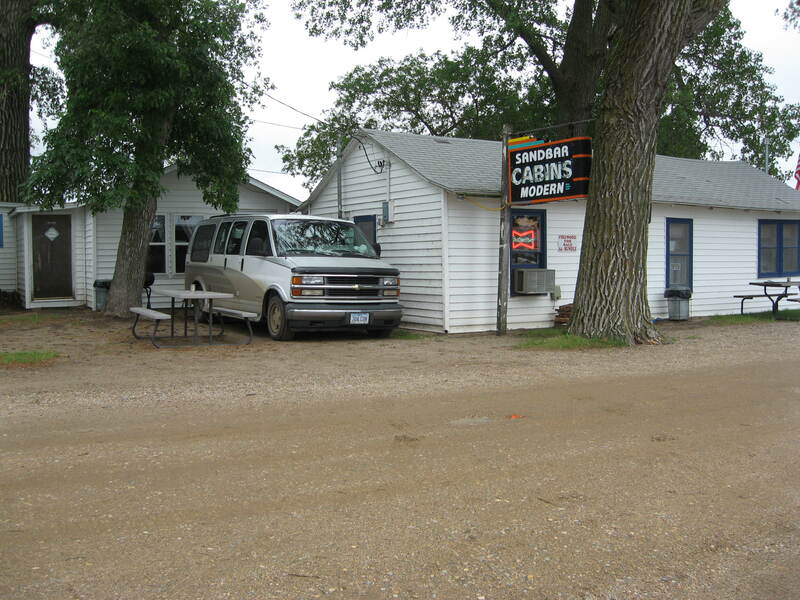 The venerable 61 Drive-In, located south of Maquoketa, opened in August of 1950 and is still going great guns. Grandview Drive-In Theater, which opened in 2007, is located just north of that community along Highway 61 south of Muscatine. But if you haven’t been to a drive-in theater for a while, you will notice one big change: The post-mounted, wired speaker you used to hang on your car window is a relic of the past. Motion picture audio at drive-ins now comes from low-power radio transmitters whose signals are picked up by car radios. Copyright 2010 by Phil Roberts, Creative Enterprises. This article has been submitted as a column to The North Scott Press, Eldridge, Iowa.